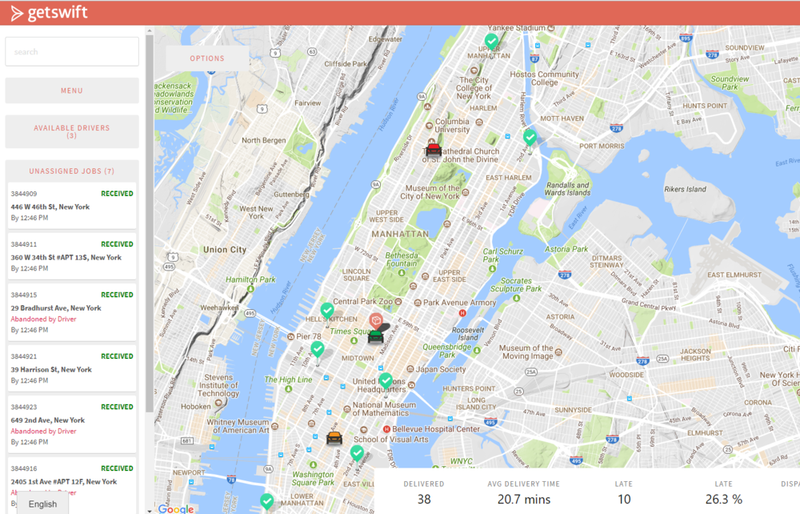 The map view in your GetSwift account makes it easy for you to track your jobs, view where your drivers are, or contact them. 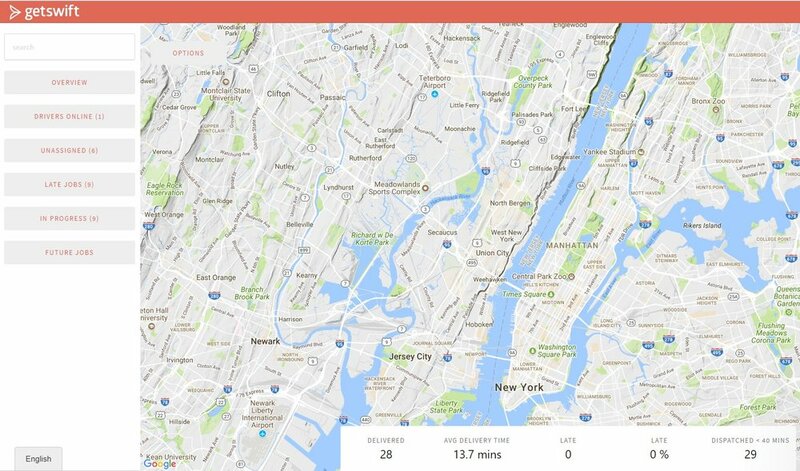 Click on MAP on the top navigation bar to navigate to the page. DRIVERS: You can see which drivers are online at a given time along with their current status that updates dynamically as the driver works his/her task queue. JOBS: Here you filter your current jobs whether they be in progress, unassigned, late, or scheduled in the future. DETAILS: Click on any marker to show more information about a delivery or a driver. The panel in the lower part of the map screen will give you insights into your daily activity. The 5 data points listed are daily metrics/KPIs about your delivery operations. You can select which 5 metrics you would like to be visible in the OPTIONS window located in the upper left part of the map. Nothing displaying on your map? Click OVERVIEW to remove the filters and see all of your drivers and jobs on the map! Learn about the automated and manual ways to add new jobs to your GetSwift account. Learn how to automatically or manually dispatch your jobs to your drivers. Learn more about how to real-time know your drivers location and delivery status. Analyze your data to save money by making your business more efficient. In this list view, you will be able to assign, modify and cancel jobs. While there is not a map on this page, you can still track the status updates of jobs through the progress bar. Dispatch Status: Indicates whether the job is Submitted, Ready for Driver, Waiting for Driver, etc. In the Map screen you are able to see a list of the drivers online, including their status by the color of their name and car. When should a driver push ON WAY / START? Automatically optimize the delivery route for each driver based on factors such as distance or promise time. This will save you a lot of time planning out daily routes, as well as the driving time, fuel and distance travelled by each vehicle. Contact the GetSwift team to enable routing! Click on the corresponding JOB tile listed under ‘jobs in progress’ and you will see a red line with that route. Driver Match Keys allows you to automate assignment of drivers to specific tasks when entering tasks into GetSwift through the API or Batch Upload methods. When you click into any driver from this panel, you are able to interact with and make modifications to the driver settings on the spot. On the Manage Driver page you can view a list of the drivers who you are invited, activated, awaiting approval, deactivated, and even those who are online. Additionally, you are able to manage their permissions and details. If a driver forgets to log-off their shift, learn how to take driver offline by using the Driver Profile. Limit the number of tasks a driver can be assigned to do at any given time . There are 5 ways that the GetSwift system can send/notify new jobs to your drivers. In order to manage a job directly from the Map view, click on the specific job tile you wish to view or edit. Shows current job load and distance from the pickup. An algorithm ranks the drivers based on who is the best fit to take this particular job. Interact with and make modifications to the driver settings on the spot. Although we want to automate your business, sometimes you may want to manually notify/dispatch a job to a driver. Although we want to automate your business, sometimes you may want to manually assign a job to a driver. Unassigned tasks are those tasks that a driver has not yet accepted. This view will show where these tasks are located on the map along with the full task details in the left panel. Notice, these tasks will be marked as “Received” to easily distinguish them when viewing all jobs in this panel. Under Notifications, you will see a list of drivers. It also shows their current job load and distance from the pickup. Jobs that are assigned, accepted or on way to the destination. Overview of managing your drivers and jobs within the map. Jobs in Progress provide a quick view into all the tasks that have been accepted by your drivers. The driver can be on his/her way to pick-up, or on-way to drop-off, all the while you can track this by the dynamic status changes from Accepted, to En Route. Drivers are required to perform three essential actions for each order: Accept, En Route, Complete. Are your jobs not turning to “En Route” at the right time? Learn best practices for the driver app. Late jobs are the orders that have yet to be delivered to the end customer and surpass the latest predetermined drop-off time window. You will quickly see when the job was due, whether it was abandoned by the driver and its current status of Received, Accepted, or En Route for quick planning to get back on track. Rush a task to be prioritize above other accepted jobs and the driver will be notified of this change via the mobile app push notifications. Set “On Way”, which will trigger the en route alert if that is customized in your settings. Complete a task for the driver. Remove Driver and the task status will automatically update to Received. Do you give your drivers the ability to accept & reject jobs but need to manually assign a specific order? Learn how to here! No matter what your Driver Notification / Dispatch is set to, learn how to re-dispatch jobs on the go and anytime. Learn how to transfer a specific job or transfer all jobs, between different drivers.